Hugh Pym was chief economics correspondent for BBC News before taking over as its health editor earlier this year. 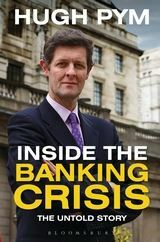 His focused account begins with the downfall of the Newcastle-based former building society Northern Rock in September 2007 and ends with the announcement of RBS’s £8bn losses in February 2014 but the meat of the book describes events in Whitehall and Westminster in September and October 2008. This was the time when the banks ran out of money and a small group of ministers, Treasury officials and central bankers worked round the clock to devise a rescue package. The tale is dramatic and the telling is atmospheric: late-night curries ferried in to the Treasury, a minister blundering into prime minister Gordon Brown’s sleeping quarters in the middle of the night, chancellor Alistair Darling grabbing a couple of hours sleep before appearing on Radio 4’s Today programme, bankers sneaking in to Whitehall to avoid the media, and mysterious leaks to Pym’s BBC colleague Robert Peston, whose blogs and broadcasts caused panic. One of the most striking features about Pym’s book is the detail it reveals about the investment banks’ role in the resolution of the crisis, a point on which the author might have elaborated. It jars to learn that, having brought the country to its knees by selling high finance to gullible banks such as RBS and HBOS, the investment banks were then all over Downing Street and the Treasury advising on the clean-up. This is problematic, for however clever, charming and resourceful investment bankers might be, they all think the same way about the kind of financial system we should have.